Aviation from A to Z. In Russian only, but terrific if you read it. AND if you do not, drawings and photos accessed by clicking on the Russian word "�oto" in the upper right-hand corner of each article left of the picture of the computer monitor showing the Su-27 flying out from the screen. Combat Aircraft.Com. Great drawings. Photos, too. Click on the tiny 3-view to see it enlarged. Eastern Wings, a page mostly in Hungarian, but with English text, too. A few photos. Not updated since 1996. TaskForce Russia. US-Russia Joint Commission Documents Database. The Library of Congress is working very hard to upload all of the documents that the Russians have provided the United States since the end of the Cold War. Those that are there already make fascinating reading! Russian and Soviet Aircraft Symbols. Markings. �������� --> ������ --> �����k��� --> "����-�����"
Aircraft Resource Center. Worldwide aircraft, but see especially his Walk-arounds section for great photos of Russian aircraft. The Complete Catalog of World Aviation. Terrific site! Photos, video, much more. Link for translation to English on left side of page. A Corner of the Sky, a Virtual Aviation Handbook. In Russian only. Very nice. Has a site search capability if you can type in Cyrillic. Justplanes.Com. Photos, links, news, CDs of photos for sale, much more about airlines around the world, including the former Soviet Union. Ken Duffey's Index Page. Formerly "The Duffey OKB" Dozens of photos. Kron's Air Base. In Russian and English. Lotnictwo Net - Polish Aviation Site. Formerly Lotnictwo OnLine. Maxim Volkonovsky has some very excellent, high-quality photos at his site. They include a picture of the cockpit of the Yak-141. The links take you to the MAKS 95 show, Monino Museum, a Sw�dish air museum, and MAKS 99. No updates since then. Milavia is a very large site with many, many photos of Russian aircraft. Military Aviation Pictures Page. Large site, includes some familiar photos; also non-Russian aircraft. Since 2004, he seems to be concentrating on selling CDs and videos and does not appear to be updating the photos. Russian Power. This site's Russian aviation section is terrific! It has some unusual aircraft. Please note: Because the link is in Cyrillic, not Latin characters, this link redirects to the Tiny URL site where you must then click on the link there to reach Russian Power or its aviation pages. Russian Wings. In Russian only, some interesting links. Some photos seen before. 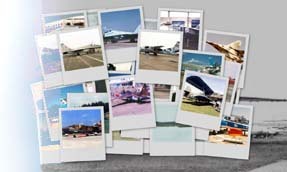 A Series of my Photographs from Air Salons and Exhibitions. This page, in Russian only, has links to hundreds of photos taken by the site owner. There are photos of every Moscow airshow since 1995, photos of shows in Eastern Europe, shows at Russian airbases, and much more. The photos are beautiful. Do not miss this site! TOTAVIA Aviation Image Archives by Adrian Cybriwsky. Now called Warbird Photos.Net. Of the hundreds of photos in this archive, there are several dozen pictures of Soviet/Russian aircraft, most of which I never have seen before. (But one will be familiar to regular visitors of Roy's RUSSIAN Resource). Warbird Photos.Net See description for TOTAVIA, above. World Air Routes. Information about airlines, the planes they fly, their routes, and more. The Aero Section has a few Russian aircraft photos. Check out especially his "private collection." Not updated since 2003. AeroWorldNet has many articles and photos about contemporary Russian aircraft. Just put a word or a designator into their search engine. Alec's Av Mania. Nicely designed front page. Interesting photos. Aviaworld's Military Aircraft Photo Gallery. Some very nice photos. Flickriver. This interesting mega-site contains hundreds, perhaps thousands of interesting photographs, some in 3-D. In particular, enter "soviet aircraft" into the search box at the top for dozens of rare and interesting photos. Continuing to scroll down brings more photos. Clicking on a photo brings further information, more photos, or desk-top sized images. Frisian Aviation Studio. New photos never seen elsewhere on the Web. Several photographers contributing. Links to other sites about VVS, Soviet and Russian aircraft. Wow!! Modeling the Soviet VVS. Some terrific drawings and photos, not to mention history. Rod's Warbirds. A large number of sometimes very rare, mostly black and white photos from The Great Patriotic War era.